Atlas of the United States. County Map of California and Nevada. 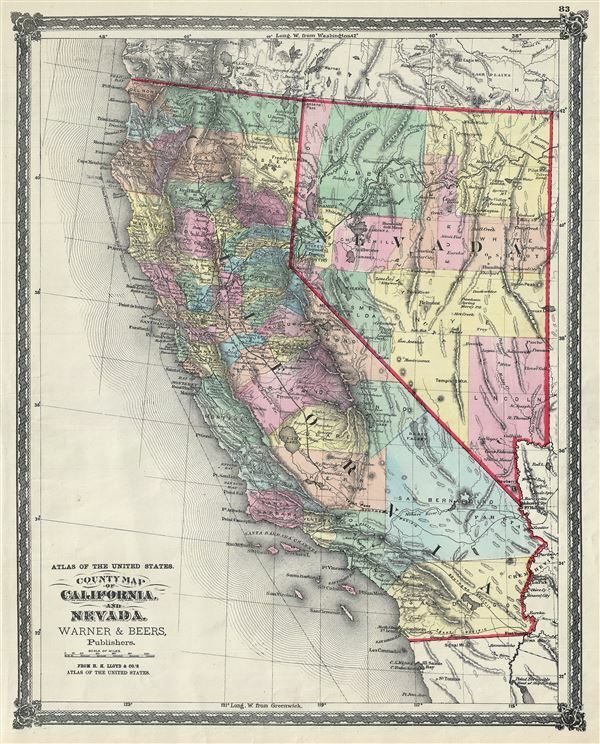 This is a beautiful 1874 Warner and Beers' map of California and Nevada. It depicts the states of California and Nevada in extraordinary detail, noting major towns, counties, cities, lakes, rivers, railway lines, roads and other topographical features, with relief rendered by hachures. The map is color coded according to counties. This map was issued as plate no. 83 and published by Warner and Beers and is derived from H.H. Lloyd and Co.'s Atlas of the United States. Rumsey 2585.077 (1872 edition). Phillips (Atlases) 1576.